Big Twin Rear, 1981-1984. Fits all 4-speed, square swing arms with 11.5" rotor, from 1981-1984. 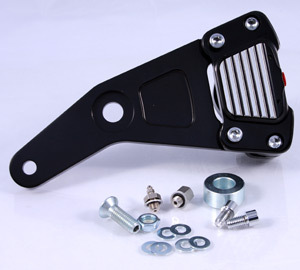 Hardware, machined aluminum bracket, fittings and axle spacer are included. Will not fit FLT / FXR, 84' FXWG or 84' FXE models. Kit requires 5/8" bore master cylinder. Available in Classic Clear Anodized, Chrome, Smooth Chrome, Black and Smooth Black.